Eagle''s sporty coupe with optional turbocharged motor. this is my 3rd dsm, I had a 2nd gen eclipse gs and a gst, now I have a talon esi. This car has much to be desired in the power dept, but cant be beat in looks and comfort. I've put about 1500 in it so far, but I knew it would take some work. I think another 2 grand in the body and it'll look brand new. Some years tend to perform crappy, i guess my car was the lucky year. Like i said before the car handles amazingly well, even in the winter i never had any problems with my car. The acceleration was alright, especially for a 4cylinder 2liter engine. I suppose it helped that i had a few performance upgrades in the engine too though. Now all this great stuff about the car and it was an automatic, imagine if it were standard. The car would have performed that much better. uhh... jetta, really old bmw... that thing was crap... mustang cobra, thats a nice ride too, horrible in winter though. Ford Fusion, also nice but didnt get to drive it too much. With all older model cars, they'll need some catch-up work depending where you get it. Loved the car. The dealership screwed me over, the car needed repair but the car itsself was wonderful. Ran like a dream and was fast and quick to get up although you could tell it'd been ran through the dirt. I'd recommend one for a beginner driver or someone who wants a nice project car. Not built well. Parts are really expensive and custom to dealer specs. Poor interior. Flaky door handles. Does not handle well in rain. braking design flawed. Timing belt needs to be checked periodically. When we first bought this car it was in fair shape. We decided to fix it up. First thing we got was a carbon fiber hood, z fenders, body kit, rims, clear euro headlights, and tailights, lowered injen intake and megan racing strut bars. This car is a heck of a car with 260000 miles on the engine I can still line up with the 2gr and smoke them if tghey aren't turbo lol. These cars are very easy to modify and once modified are a beautiful piece of art and not to mention very very fast even the 1.8 sohc like this one. lots of road noise(even when it was brand new),brakes pulled to the right(I was told by the dealer that it was a design flaw)polycast wheels dinged and dented very easily under normal driving,the timing belt was expensive and dealer only at the time,fog lights kept burning out,lots of squeaks and rattles developed.silly things kept breaking like door handles,body molding,wipers,power windows,many electrical issues.I always wished that I had purchased something else.When driving the vehicle, it's got that I'm sitting in a whole feeling.Sometimes I had a hard time seeing over the dash.Poor visibility while backing up or changing lanes due to those little triangle back windows.A/C went after two years then the whole vent stopped blowing air. When I traded it in it had over 120,000 miles.The vent no longer worked.Yes, that's right-no air blowing in.The car was literally falling apart.Shortly after owning it, the side moldings began to fall off.I went to the dealer on several occasions to constantly reattach the molding.The only problems that i had with the vehicle were a series of small things(stress crack on the windshield,air vents not working,wiper motor froze in the snow,Etc. )After about a year of New England driving,all four of the original factory rims had dents and flat spots which made for a rough ride.I didn't have TURBO nor did I have AWD.The front wheel drive was more than sufficient.The seats were very supportive;however, they developed a squeaking problem after two years.I had the car a total of 5 years.The model year after mine was a complete redesign.I always wished that I had waited.I heard that alot of the quirks which I hated were improved upon.It was a fun vehicle;however, I wouldn't reccomend it to any mature drivers.Definitely a kid's car.In closing I just wanted to say that I liked the car at first,yet quickly grew tired of it and the little nuances that came with it.Again, it was a fun car and a fun era in my life.I just wished that Chrysler had built the car a little better than they did. most beautiful car, will treat u well if u treat it well. no problems otherwise an accident. hard to find parts and parts are expensive. Took me 4 weeks to get a back bumper. The Talon is the sexiest car out there. For it's price, it get's more looks then most other expensive cars. The sports cars sleek look, has enough power for a non-turbo. I now have 18' rims, lowered, exhaust system and a full stereo system. The best thing about this car is it is beautiful stock and can be one of the nicest, fastest done up cars too. I have been living for this car since gr 9 and i have now had it for a year but not driving it in the winter. The stock front bumper gives it such an aggressive look compared to the older models. I wouldn't want any other car but the talon. I bought mine after it was fixed after jumping a curb, and still no problems even after my accident. Looks INCREDIBLE, handles AMAZINGLY, hugs the rode like no other and is zippy even without a turbo. Parts hard to find - I had the passenger door exterior handle break and it took me forever to find a replacement one. Other than that, not a thing! I have coveted a Talon ever since I was 16 years old, so when I saw this one was so inexpensive I HAD to have it. I bought it with known problems (body damage, leaks) and other than having it backed into on 2 seperate occasions (both times driver front fender), I had little problems. I did fork over the $900 to have the head gasket replaced and the timing belt changed. Other than that, the only thing I replaced was spark plugs/spark plug wires. Just as a hint, if the engine is "missing" or running rough, have the plug wires checked top make sure they aren't burnt out or that they don't have moisture in them. I sold it almost a year after I purchased it to a lucky high school kid who is still drivin it around (although I noticed that the same front fender has been hit once more). 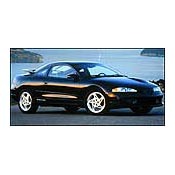 I am buying a 97 Talon ESi to replace my Mitsubishi Lancer which is also a fun car but nowhere near as fun as a Talon!